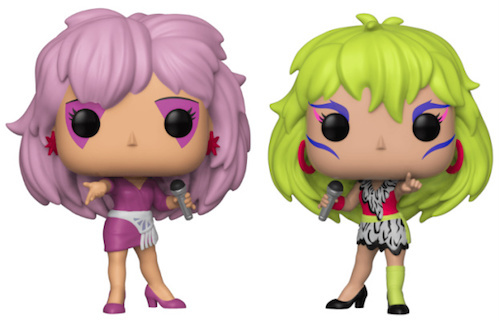 Product DetailsThe 1980s rockers return to the spotlight in Funko Pop Jem and the Holograms. The vinyl set goes bold and bright with options for Jem and Pizzazz. The era of big hair and vivid styles is on full display in Funko Pop Jem and the Holograms. Lead singer of Jem and the Holograms, Jem (a.k.a. Jerrica Benton) rocks a lot of purple, including varying hues for her hair, dress, shoes, and eyeliner. Kimber Benton, Aja Leith, and Shana Elmsford are MIA for now, so collectors will need to wait and cross their fingers if they hope to own the full band. Shop Jem and the Holograms DVDs on Amazon. However, lead singer of the Misfits, Phyllis "Pizzazz" Gabor, is ready to battle Jem for rock supremacy. Her Funko Pop Jem and the Holograms figure is a bit more wild with many colors in play. Both singers naturally hold microphones while gesturing to the crowd. The animated Jem and the Holograms series initially ran for three seasons (1985 to 1988). A live-action film of the same name released in 2015. FUNKO Jem and the Holograms Pop! Vinyl Figure Pizzazz Gabor  NEW IN STOCK! 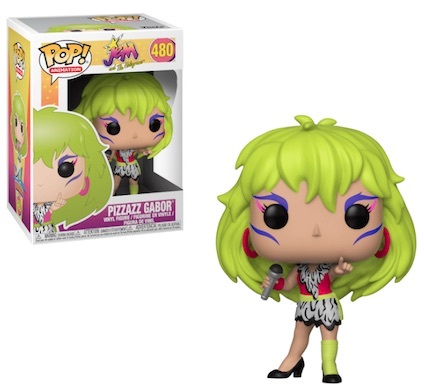 Jem and the Holograms - Pizzazz Gabor Pop! Vinyl - FunKo Free Shipping!